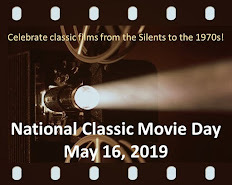 Classic Film and TV Café: Feel Good Movies: "I Hope You're Going My Way Too"
Feel Good Movies: "I Hope You're Going My Way Too"
In May of 1944 the United States was embroiled in the dark days of World War II. After 2 ½ years of war, grief and fear of the future, American audiences chose as their favorite movie a little film which helped them remember what life is ultimately about -- love of God, love of people, humor in the midst of difficulty, ordinary human beings living each day as it comes. Going My Way was a Paramount film directed by Leo McCarey. McCarey was known mostly for his comedies before the 1940’s, working with such greats as the Marx Brothers, W.C. Fields and Mae West. During the 40’s, McCarey became increasingly concerned about the needs of people struggling with wartime difficulties, as well as social injustice of the economically disadvantaged. Going My Way is the story of two Catholic priests at St. Dominic parish in a poor neighborhood. Fr. 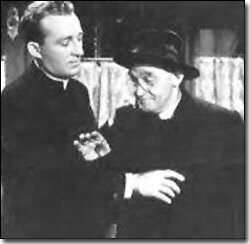 O’Malley (Bing Crosby) arrives at the parish supposedly to assist the aging pastor, Fr. Fitzgibbon (Barry Fitzgerald). In point of fact, the Bishop has plans to eventually replace Fr. Fitzgibbon, who is now in his 70’s and is reluctant to retire. Fr. Fitzgibbon has been a priest for 45 years, and it has been that long since he has seen Ireland or his now extremely elderly mother. Fr. O’Malley’s modern, easy-style personality rubs the fiery old pastor the wrong way, and Fr. O’Malley is kind to him, always careful to show respect and patience in their relationship. Throughout the movie, we meet people who cross paths with Fr. O’Malley – Carol (Jean Heather), a runaway whose future causes no end of concern for the priest, Ted Harris Jr. (James Brown), whose interest in Carol is a further cause for concern, Genevieve (Rise Stevens), whom Fr. O’Malley once loved, and a gang of neighborhood boys led by Tony Scaponi (Stanley Clements). (You have to love that name, Tony Scaponi!) A third priest, Fr. O’Dowd (Frank McHugh), the same age and modern outlook as Fr. O’Malley, turns up to be another thorn in the old pastor’s side. Fr. O’Malley deals with each person in the same spiritually dedicated, yet firm feet-on-the-ground attitude which characterizes his moral makeup. There is great humor in this story, sorrow, and an ending that is quiet and intensely moving. Going My Way is a slice-of-life movie, simply portraying the life of a church parish day to day. There is no hurry to McCarey’s direction, allowing each scene to unfold with rich personality and character-driven plot. 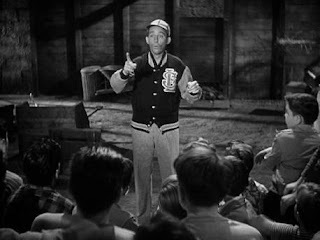 The audience feels as if they know the people in this film as old friends, as proven by the fact that this was the highest-grossing film of 1944. In those days, without television or re-runs, that meant that there was a lot of repeat viewing and thus more theatre tickets sold. Going My Way swept the Oscars that year, winning best picture, best director, best actor for Crosby, best supporting actor for Fitzgerald, best screenplay, best song for “Swinging On A Star” written by Van Huesen and Burke. This was in a year where competition was stiff and the movie was up against such films as Cary Grant’s Arsenic and Old Lace, Olivier’s Henry V, Garland’s Meet Me In St. Louis and Ingrid Bergman’s Gaslight, among others. Interestingly, Fitzgerald and Crosby were both nominated for best actor, as well as Fitzgerald’s nomination for best supporting actor, a double-nominee practice that was later disallowed. The cast of Going My Way is one that shines in its individual parts. Bing Crosby is perfection as the younger priest who sings and plays piano, just as comfortable with boogie woogie as spiritual songs. His work with the neighborhood boys in turning them into a choir is beautifully portrayed. (One of the boys is Carl “Alfalfa” Switzer who we remember from Our Gang serials.) They truly sing like angels when they perform the title song with real-life opera great Rise Stevens. But it’s their performance with the song “Swinging On A Star” that audiences really loved. The film also introduced a lovely little lullaby, "Too Ra Loo Ra Loo Ra", which captured the hearts of many. The part of the old pastor, Fr. Fitzgibbon, seemed tailor made for Barry Fitzgerald. Fitzgerald was 56 at the time, only 15 years older than Crosby, yet he seemed and looked very old, a testament to his acting and good makeup. He is funny and sweet in his part, and you can’t help but love him. Wonderful Frank McHugh as Fr. O’Dowd is the perfect comic relief with his distinctive way of speaking and his famous high breathy laugh. McHugh was a member of the Irish Mafia, a spoof name for a group of actors, mostly Irish, who met fairly regularly which included James Cagney, Spencer Tracy and Pat O’Brien. Stanley Clements (Tony Scaponi) eventually replaced Leo Gorcey in the Bowery Boys last seven movies. 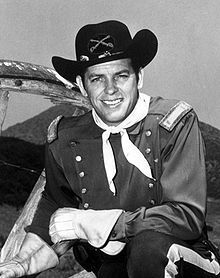 And, if you are old enough, you may recognize James Brown (Ted Haines) as Lieutenant Masters in the Rin Tin Tin television series. The rest of the supporting cast round out this wonderful ensemble with solid performances. In the next year, 1945, Crosby again reprised the role of Fr. O'Malley in The Bells of St. Mary's, which also starred Ingrid Bergman. Once again the film was a huge hit, and in my opinion, Bergman still holds the gold medal as best and beautiful screen nun ever. 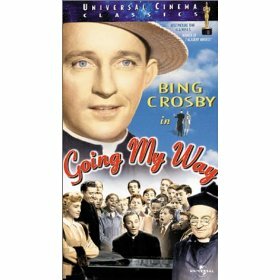 Director McCarey and Bing Crosby were both devout Catholics and that shows in their dedication to the film and their love for the ideals of the Church. After the war, Crosby obtained permission to screen the movie for Pope Pius XII and met with him personally. Some, particularly in our own time, pronounce this movie as saccharine and overly-idealistic. I disagree completely. It truthfully set forth ideals and the efforts of ordinary people to live up to them. 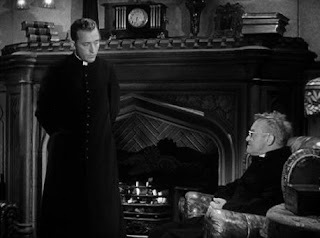 Now, when scandal has marred the image of the Catholic Church, this little movie is a timely reminder that the same ideals are still there, and that 99.9% of priests are as good and dedicated as Fr. O’Malley. That is a living legacy from Leo McCarey and Bing Crosby. Ah, yes, the essence of a "feel good" movie. Made during the time of war, and audiences flock to it to escape the somber atmosphere. Thank you for sharing this film with us, Becky. And while I think Deborah Kerr was a stunning nun (more than once! ), I completely agree with you: Ingrid Bergman is the most beautiful cinematic nun to ever grace the screen! Becky, this is an insight (as always), loving tribute to a wonderful movie. All the James Van Heusen-Johnny Burke songs are good. You mentioned the two big hits, but I also like the title song and "The Day After Forever." Have you seen WELCOME STRANGER, which reunited Crosby and Fitzgerald in somewhat similar roles? It's a pleasant movie, but not as heartfelt and I think that's because McCarey didn't direct. I love your line about McCarey "allowing each scene to unfold with rich personality and character-driven plot." Not many directors can do that. By the way, when you're in a pinch, don't you wish you could just dial "O" for O'Malley? posts and I find it very helpful. this one definitely hits the spot when you're looking for a feel good movie. i always preferred "going my way" to "the bells of st. mary's." 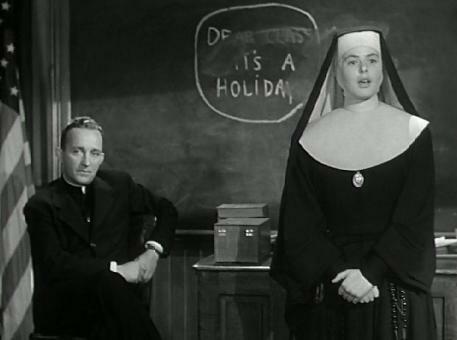 the only area where "the bells of st. mary's" had the advantage was with ingrid bergman as a nun. why weren't there any nuns that looked like ingrid bergman when i went to catholic schools? i remember we had one nun that was so ugly we nicknamed her "bulldog." in any case, thanks for this review. as a catholic, i have a special appreciation for this film. Becky, I always look forward to reading your reviews. THE BELLS OF ST MARY'S, is one of my favorite movies to watch during the Christmas Season. I have a soft spot for sentimental movies of the 40s . Becky, this is truly a lovely write-up! You have such a heartfelt way of expressing yourself and I could not help but smile when revisiting this dear film through your eyes. What a wonderful selection for a Feel Good Movie! Thank you for your magnificent tribute. How about Fitzgerald as Michaeleen Flynn in THE QUIET MAN?